Stainless steel chains are applied in extreme conditions such as underwater, acid or alkali, high and low temperatures ranging from -20°C to 400°C and sanitary conditions. The SS (SUS304) chain is the standard chain used for such environments. 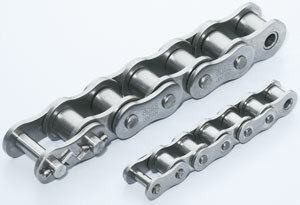 The AS (SUS360+SUS304) chain is available for higher load requirements. The NS (SUS316) chain is available for more corrosive environments. Available in sizes RS11 to RS240 and RF2040 to RF2160.